A couple of days ago I was watching The Daily Show when getting ready to walk to campus and I saw a trailer for Janie Face to Face. As a 90’s kid I was hooked. I downloaded the book to my Kindle with embarrassing speed, as well as the 2012 short e-book What Janie Saw, and surreptitiously started reading in stolen moments before a weekend binge. 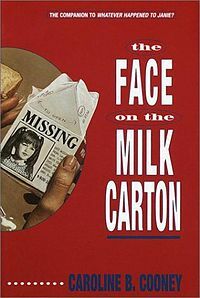 Caroline B. Cooney’s Janie Face to Face (released Jan 8th) comes 22 years after The Face on the Milk Carton and 12 years after the last book in the Janie Johnson Series, What Janie Found. For many kids in the 1990’s* these books were a staple of their leisure reading. I actually read more young adult literature now than I did as a teen, as I was an unbearable snob, but Caroline B. Cooney’s books were the ones I read. Her Both Sides of Time series was one of my favorite things. I was excited and curious about why Cooney would pick the series back up after all these years. What I’ve found in reading Janie Face to Face so far is that for the most part it feels like a natural continuation of the series I loved as a kid. Sure, some parts seem really silly to me now at 26, but at 13 I wouldn’t have felt that way. Cooney continues to focus on the un-winable situation Janie and her two families find themselves in. Unlike in the previous books, however, Janie starts to make a transition from the Johnsons to the Springs and from childhood to adulthood. The stakes feel different as Janie figures out how to stand on her own and construct an adult identity (well, she sort of stands on her own). Going to college in New York provides her the anonymity to find herself while also locating her equidistant between her New Jersey family and her Connecticut family. It’s a pretty smart narrative move as it works on a metaphorical and a logistic level. Hannah is back in this installment in a way she hasn’t been included before–and that’s her beef. Cooney’s writing is at its most heavy-handed when writing this character. Hannah is clearly deranged and views the world in terms of other people having too much and her having too little–possessions, credit, love, etc. She seeks to take her revenge on Janie and her parents (the Johnsons/Javensons) by taking part in a true crime book that seems to paint them as child abusers whose parenting created the horrible life that drove Hannah to a cult and later to kidnapping. There’s more, but I don’t want to spoil it for anyone. Though some of the romance and the portrayals of Janie at college are too-simple and too-happy, what actually bothers me most about this last installment is the adjusted timeline. The books all took place in the early-to-mid 1990’s. The core readers of the series were raised during this time period too. As What Janie Saw and Janie Face to Face pick up in Janie’s senior year of high school, it should still be the mid-90s. But the timeframe jumps forward to the present day–seemingly only in technology. It’s really stilted and weird. The whole thing feels like some editor told Cooney that she needed to appeal to contemporary young people and she decided technology was the easiest way. It’s just crammed in. Instead of talking on her cell phone, Janie is always on her “beloved iPhone,” which doesn’t sound natural. Plus, she uses an iPad and an e-reader. How many devices does she need!? Also, she uses Facebook but doesn’t post to it. There are some interesting questions to explore here, really. The most obvious fact is that Janie was kidnapped before Amber Alerts. The whole story is based in a world before social media, before Nancy Grace, back when it was possible for a 15 year-old to see her face on a milk carton and have to take her time figuring out what that meant. In the movie** she uses microfiche at a library to find newspaper articles about the kidnapping. By shifting to 2012, that means that social media and a more invasive media would make Janie’s experience and lack of privacy harsher. Actually, the new technologies would be more interesting if 1) the timeline made any sense and 2) they were used well instead of just getting crammed into an otherwise non-tech-savvy narrative. Part of why I suspect that this weird writing move was driven by bossy editors/marketers is because of the updated covers. In 2012, ahead of the release of the e-book and the new novel, the book covers were given a second reboot. (There was another, less dramatic redesign in the late 1990’s). The latest covers are actually really striking. I like them a lot, but I think they also show a dramatic shift in how books are marketed to teens. The black and white scheme is reminiscent of Twilight, 50 Shades, and The Hunger Games. The simple design with the haunting image also fits well with today’s book market. 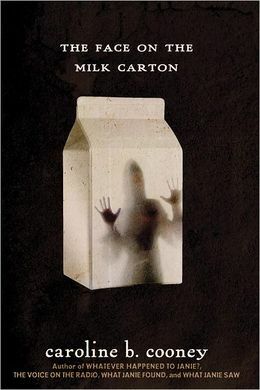 I think the design works beyond a gimmick level, however, because it really captures the way that Janie was trapped by the face on the milk carton. It’s pretty cool. It works. I think the mistake in the technology aspect, however is that it’s unnecessary and nonsensical. The core readers for this new book are probably going to be people like me–twenty-somethings who grew up on the series in its original release. The covers may work to draw in new, younger readers, but the technology won’t. They will surely pick up on the arbitrary usage, the weird timeline, and the technology won’t even be novel to them. The story is pretty compelling, why gum it up with unnecessary product placements? Anyway, I think Janie Face to Face is worth a read if only for the jaunt down memory lane. On its own, however, it’s a fine young adult novel. Not the best I’ve ever read, but entertaining enough and it does engage on some level with how a young woman constructs an identity under the pressure of media voyeurs. It shows a definite downside of the overnight celebrity. Have you read it? What do you think? What’s your favorite Janie Johnson moment or memory? Shame on me, I responded, “But they were girls’ books!” To which he frankly said, “So? They were books.” That’s what a keeper sounds like, folks.